The following topics describe some of the objective-related views that are available in PMF. The Objectives - Previous vs. Current view displays current and previous period achievement and comparative weights for the primary objectives across all perspectives for the selected scorecard. This view displays a dimension tree to the left of the report that enables you to drill into the underlying metrics of any particular area of the scorecard. You can analyze the previous and current period performance of the objectives for any aspect of any dimension. 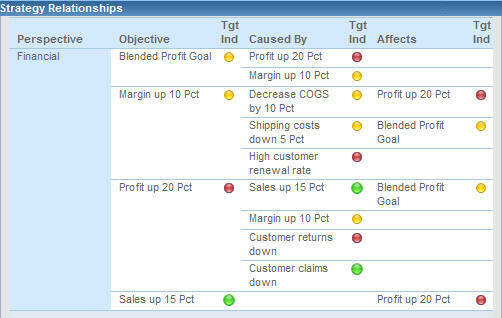 To run the Objectives - Previous vs. Current view, select Analysis, Objective, or Perspective in the Type drop-down menu of the Analytics tab, then select Objectives - Previous vs. Current from the View drop-down menu. The following image is an example of the Objectives - Previous vs. Current view, which displays the heading Perspective - Objectives Summary Grid. When using the tree to drill into a specific area of the scorecard, the view is refreshed and a summary of the type of objectives you are viewing appears at the bottom of the report. When you click a Perspective drill-down hyperlink, for example, in the Strategy view of the Executive Booklet, and select Show Objectives (Curr vs. Prev), the drill down takes you to the Objectives view, as shown in the following image. In this view, current metrics for an objective are compared to previous metrics for the selected objective, and the trend, scorecard weight, and perspective weight are displayed. To display related data for an objective, click an Objective hyperlink and select the desired option. For a list of available drill-down options, see Objective Drill-Down Options. When you click a drill-down hyperlink, for example, in the Stop Light view, and select Causes & Effects, the drill down takes you to the Causes & Effects view, which contains data showing strategy relationships. If you have a strategy set up in PMF, you can drill down to research strategic relationships for any metric. Cause and effect relationships cascade automatically as you navigate drill-down hyperlinks for metrics in the Caused By and Affects columns to move up and down the strategic chain of events. The following is an example of the Causes & Effects view. The Causes & Effects view displays hyperlinked metrics in the Perspective, Objective, Caused By, and Affects columns. To display related data for the perspective, click the Perspective hyperlink and select the desired option. For a list of the available drill-down options, see Perspective Drill-Down Options. To probe deeper into the metrics listed in the Objective, Caused By, and Affects columns, click a hyperlink and select the desired option. For a list of the available drill-down options, see Objective Drill-Down Options.